Constitution Drafting, State Restructuring And The Peace Process In Nepal: What Next? 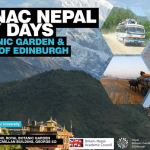 A roundtable discussion organised by the Britain-Nepal Academic Council and the UK Constitutional Law Group, for the Centre of South Asian Studies, SOAS. 5pm, Monday 13 June, 2011; Room G51, Main Building, School of Oriental and African Studies, Russell Square, London WC1H 0XG.